Reverend Martin Luther King Jr. gave this speech on the steps at the Lincoln Memorial in Washington D.C. on August 28, 1963. It was an inspiring speech that has been repeated by many students. The speech stated Rev. King's dream for better attitudes and relationships between people. Some of King's speeches were written by Stanley Levison. It is said that he also helped King write I Have a Dream, but that has never been verified. Levison had also been under FBI scrutiny for having Communist leanings. 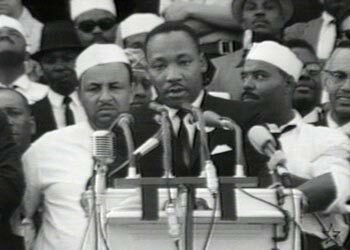 An interesting note on this speech is that the famous "I have a dream" part almost did not get into the speech. King's advisors Andrew Young and Ralph Abernathy told him that section was worn out, because he had used it in 25 previous speeches and church sermons. It was a "killer ending" that was meant to inspire the audience. King thought about it, but then he still decided to include that ending in this famous speech. It was a good decision. Most political speeches are well-meaning. Outline the speech to select the mission and goals of Rev. King. You can hear an audio of Martin Luther King's speech to read along. Note that it is not King's voice but a slightly mechanical computerized voice. Unfortunately, it does not contain the inflection and emphasis of a true orator. Length of speech = 9 min. 10 sec. But not only that, let freedom ring from Stone Mountain of Georgia! Use this speech by Rev. Martin Luther King Jr. to improve your skills in speech writing, public speaking, or history.